Socially, awkward Lincoln works at an IT department of a newspaper office, whose job is to scan through emails of the journalists; not an easy feat in 1999, at the cusp of the dreaded Y2K. Because his job starts at night, he barely interacts with the employees working at the paper. But in his loneliness, he entertains himself by reading through the emails of two colleagues. Without intending to, what began as an innocent monitoring turns into avid interest into the lives of Jennifer and Beth, and unwittingly, Lincoln falls in love with one of them. After a series of close encounters, Lincoln must decide if there can be love before sight. Personal Take: After reading Landline, I’ma huge fan of Rainbow Rowell’s writing. 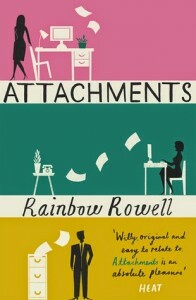 At first glance, Attachments seemed to be like most romances tangled up in the digital age of emails; light-hearted and funny. I thoroughly LOVED the email interactions between Beth and Jennifer. They are hilarious, witty, and just so much fun. Also, Rowell does a good job adding a bit of seriousness in their lives, and somehow subtly be told through their exchanges. In contrast, Lincoln’s point of view are in chapters. His is more morose and lost, but he’s still a loveable character. The people around him; his family and friends, are the real showstoppers in the book, after Jennifer and Beth. There were some hilarious punchlines throughout the book, most of them made by Jennifer and Beth. I have to say though, halfway through the book, I expected the pacing or tension to ramp up. But instead, I felt that it stayed steady until the end. I still enjoyed reading it though, and I do recommend it as a fun and light read. Audience: Older readers, for some language. Other recommendations: I’ve read and reviewed Landline. Rainbow Rowell is also the author of Fangirl and Eleanor and Park. Check out her other works!